Uncompromising. Wild. Notorious. These are all words that could be applied filmmaker Terry Gilliam. He's a mad artist, Monty Python member, American ex-patriot, and outspoken social critic who has directed iconic films like Monty Python and the Holy Grail, Brazil, and Fear and Loathing in Las Vegas, celebrated hits like Twelve Monkeys, Time Bandits, and The Fisher King. Then of course there were the flops and the reviled, The Adventures of Baron Munchausen, The Brothers Grimm, and Tideland. His fans--us included--love him for the whole of his trials and triumphs. Gilliam's films are often challenging, frequently underfunded, but always fascinating. His latest is The Zero Theorem, a dystopian drama that stars Christoph Waltz as a computer hacker desperately searching for meaning in a world run by merciless corporations. Gilliam believes superheroes are the new deities. 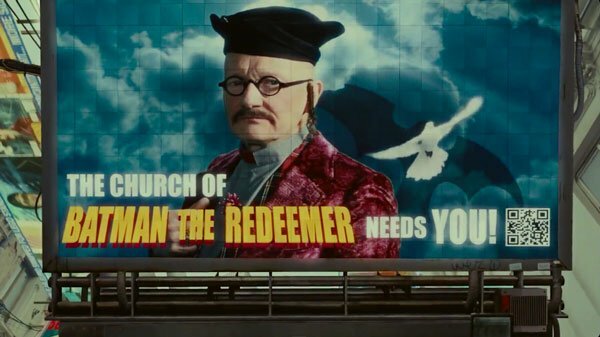 In The Zero Theorem, there's a religious sect called The Church of Batman The Redeemer. 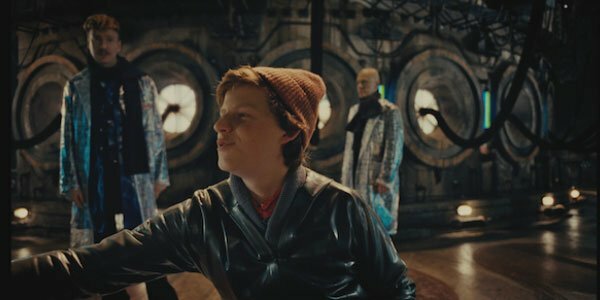 It makes for a great visual gag, but Gilliam admits this is more a comment on our modern obsession with superheroes, which he believes is on the level of devotion. "As I was walking in New York yesterday on the way to another interview," he told me, "There on the streets were all these comic book covers and images for sale. It's taken over. I mean the Church is a dying thing. But comics and Marvel are everything now, aren't they? Don't they have all the answers to our lives? Aren' they the figures that we want to copy and be like and aspire to? Don't they relieve us when we're in trouble?...I like Batman. But you don't want to believe in him!" He went on to cite the intense fandom of Comic Cons and cosplayers, saying "This is madness! It's fun for about two seconds, but when it takes over your life: look out!" Zero Theorem has Easter Eggs to other Gilliam movies. In The Zero Theorem there's a boy named Bob, who calls everyone Bob regardless of their name. In Twelve Monkeys there's a deranged old man who calls James Cole "Bob" throughout his misadventures. This is not--as I had admittedly hoped--some sign that the worlds are related. The Zero Theorem was penned by a long-time Gilliam admirer, Pat Rushin, who threaded the script with nods to other Gilliam films. "Those connections are very superfluous really," Gilliam laughed, "They are fun, but they are not essential." Gilliam could return to television with The Defective Detective. Looking over his credits, I was stunned that this visionary director has never helmed TV. He told me, "I started in TV and I left home." But then he dropped some shocking news, saying, "I'm thinking of going back. At the moment, having watched Breaking Bad, The Killing, all this stuff--this is where the good writing is. This is where you can hire the best actors--not the biggest stars--and it reaches an audience. It's the most exciting thing going on at the moment. As a matter of fact, while I'm in New York, Richard LaGravenese--he wrote Fisher King and the script called The Defective Detective--we're actually meeting on Saturday to talk whether he take that script and make it into something a little bit longer." 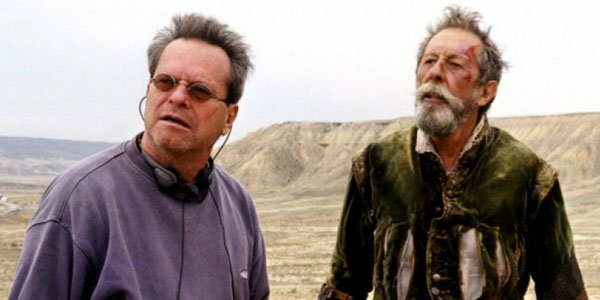 The Defective Detective is one of the many in-development projects that Terry Gilliam has teased over the years. The possibility of reteaming with LaGravenese, who earned an Academy Award nomination for The Fisher King, is thrilling on its own. But considering Gilliam's high opinion of contemporary television, it's even more exciting to imagine what he hopes to bring to its arena. Robin Williams is not in The Zero Theorem.. It's a common misconception apparently, but Gilliam was clear, "People think that. He's not in it. Robin's not in there." Read more on that here. A Good Omens movie will not be resurrected. We recently reminded movie fans of a potential Gilliam project that would have been an adaptation of the Neil Gaiman/Terry Pratchett novel about an angel and demon teaming up to prevent the end of the world for selfish reasons. Good Omens was in development back in 2002, and had Johnny Depp and Robin Williams attached. It never came together. Even the surge in Gaiman's Hollywood appeal is not likely to change that. "Neil sort of gave me the rights to it and we wrote a script. Tony Grisoni and I wrote a script," Gilliam recalled, "It was going to starring Johnny Depp and Robin (Williams) years ago. It was very funny. Johnny hadn't shot like that (he points up) and Robin's was beginning to go in that direction (gestures down). Nobody wanted to do it. Now the studios would die to put those two people in. But anyway--I'm told they are doing a TV adaptation in Britain. But it's not the script we were working from…I guess I still have the rights to the film version. Except it's complicated. The company that was doing it went bankrupt and it's controlled by the receivers now. All these things just start making me crazy." The Man Who Killed Don Quixote has financing, but no start date. This adaptation of Miguel de Cervantes Don Quixote is the most talked about Gilliam project that never was. His first attempt was plagued by "acts of God" and documented in Lost in La Mancha. But Gilliam hasn't given up on the film, and told us, "We've got money for the film." And also detailed why he refuses to turn to Kickstarter for financing. Rumors that he's working with Laika on a project are overblown. "We've kind of been not in talks. We keep reading how often we're talking," he chuckled. "But I like them! They're a good company. If we could think of something to do, it would be a good idea. I just can't get my head around it at the moment, but yes." Don't call Terry Gilliam an American filmmaker. Gilliam renounced his U.S. citizenship in 2006, partially as a protest against President George W. Bush, partially over the nation's inheritance tax laws. As a result, Gilliam can only spend 30 days in the U.S. a year until a full decade has passed. You can see his frustration over his probation our video interview. So perhaps it's none too surprising that when asked if he considers himself and American filmmaker, the Minnesota-born ex-pat said, "Not anymore, I'm no longer an American." He went on to jest that Americans can claim him as one of their own until 2016, when his probation ends. Thanks for spending 10 minutes of your 30 days with us, Terry! Zero Theorem is now in theaters.